As our economy strengthens and our population grows, Australia will experience unprecedented levels of urban development. We will need to build quickly, efficiently and strategically, while taking into consideration the wider impacts each of these projects will have on the local community and global environment. Strategic infrastructure planning and efficient project execution are crucial and Australia will need to look to new methods and digital technologies to help build a physical world around us that is sustainable for the future. The challenges faced by key players in the urban development space are constantly changing, and traditional methods of project management are no longer sufficient. Innovative technologies are needed to help tackle these issues head on by increasing efficiencies and improving how we share information both with stakeholders and the broader community. Sekisui House is a homebuilder and community developer credited with the construction of over two million homes and recognised for its trademark approach to sustainability, having introduced the world’s first Zero Emission House. It is committed to core eco-responsible design principles that enhance the social, economic and residential value of the homes and communities it develops and understands the role that smart technology has to play in the process. nearmap, and was able to dramatically transform day to day project management. Today technology enables us to experience and explore spaces instantly and without costly and timely physical barriers. With access to clear and current site images from anywhere at anytime, Sekisui House was able to monitor site developments remotely, cutting down site visits by half and consequently, cutting unnecessary costs and hours. For most project managers, hours spent in a car on route to a site has been the norm, clocking up enough kilometres to last a lifetime. For Sekisui House’s Development Manager Oliver Roborgh, the idea of going back to that day to day experience would be like stepping back into the dark ages. “In the past, I would have had to drive out to inspect a site, spend an hour or more out there and drive back to my office. That’s half of my day wasted. With nearmap, we’ve kept site visits to a bare minimum, have been able to budget and plan ahead to streamline project management and the maintenance process,” Mr Roborgh said. Being able to track the life of a project over time doesn’t just enable developers to see what has changed, but more crucially allows them to anticipate the challenges and needs of the site and surrounding area. By observing progress over time, the team at Sekisui House had a more holistic view of the infrastructure requirements of the project and were able to forward plan for expected landscaping and maintenance requirement before framing a budget. 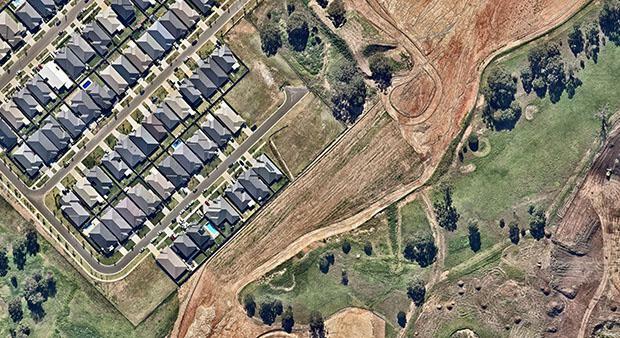 Up-to-date nearmap imagery helped them tell whether they would need to remove vegetation or install temporary roads, or whether there was a more attractive solution that could minimise the impact to the environment. When the sustainability of a project is a priority, the number of stakeholders who need to be consulted rises dramatically. Whether it’s an apartment, a playground, a shopping centre or an entire community, the potential impact of these developments on the surrounding environment and communities must be considered from all angles. Whether it’s between government bodies at the local and state level, project managers, contractors, sales and marketing teams, or the local neighbourhood, being able to share information is essential. Ensuring that information is clearly presented and understood is even more so. Through nearmap PhotoMapsTM technology, the team at Sekisui House were able to scribe directly onto high-resolution images and had an efficient platform for reporting to, but also collaborating with, a broad spectrum of stakeholders. Being able to share this kind of knowledge visually is also a positive way to involve the wider public in a project that they might otherwise feel isolated from. Stats, tables and graphs can give people facts but imagery that shows the lifecycle of a project can really engage local residents in a way that gets them excited about the potential for their community. Sekisui House was thrilled to find that by sharing this kind of imagery of ‘The Hermitage’ through its Facebook page, they were able to create a passionate and self-contained community that felt they were part of the project. They found that local residents loved seeing newly refreshed images from aerial surveys of the area, and that they were keen to share their own images and discuss the project with neighbours on social media. Today the ability to communicate with a project team, stakeholders and the wider community as we plan, design and build is a necessary factor in everything we do. Sharing visual imagery documents the lifecycle of a project and also helps us to forward plan. Not only does it cut costs and critical hours from unnecessary travelling time, but it also provides access to important information from anywhere, and the right kind of insight, without the need to be on-site. To arrange a free demonstration of nearmap click here.